The number one thing on the minds of my friends and clients when I read their card is their relationship. I totally understand why! We're always looking for insight into our partnerships and wondering what, if anything, we can do to improve things. You might know that there are cards in the tarot deck that signify relationships. There’s the Two of Cups and, of course, the lovers card! Whenever those cards show up in a reding, it’s a strong indication of a healthy relationship. It reminds us to be grateful for our partners and to honour them rather than trying to change them. With a good relationship, the two of you can fly further together than you could apart! However, there are 76 cards in the Tarot deck and I rarely if ever pull the lovers card in a romantic reading! How do you make sense of your relationship using the tarot? I’ll show you my two simple go-to spreads for relationship readings and finding out more about the dynamics between romantic partners. You should definitely do just one of these spreads at a time, so pick one to start with and then try the other a while later. I used the Wild Unknown Tarot deck for these readings. If you’ve never done a reading before, know that you can’t get it wrong. Sit with your cards and then shuffle them anyway that feels natural to you. 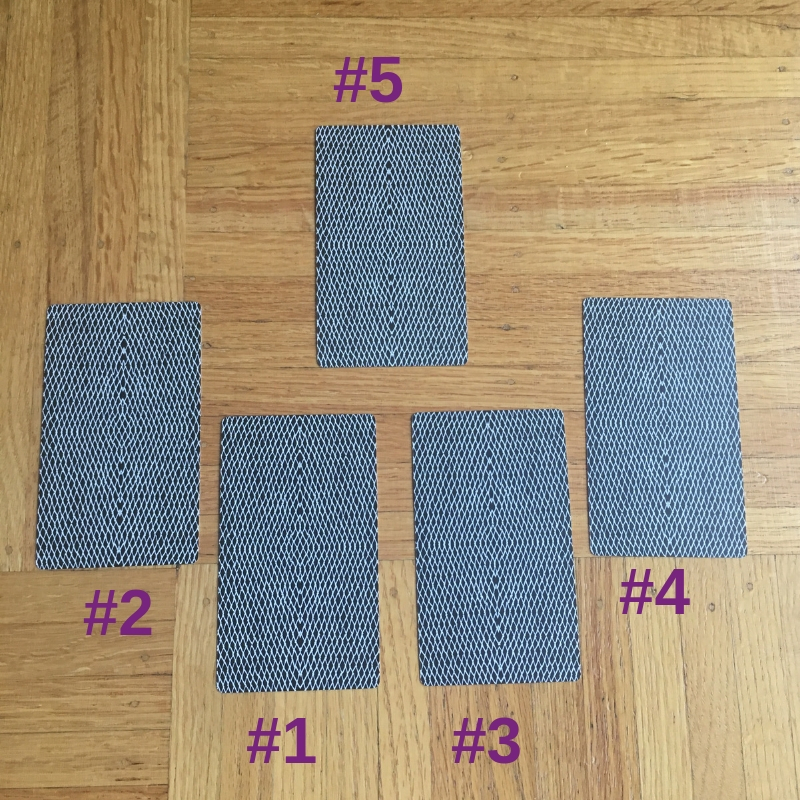 You can fan them out and select them one-by-one or cut the deck into thirds and recombine it, drawing your cards from the top. #1 “Problem” —> What is the problem in the relationship? What is holding the two of them back from a conscious relationship? What is the obstacle to overcome? #2 “Context” —> Why is this problem happening? What exacerbates it? What else do we need to consider when trying to “fix” the “problem”? #3 “Solution” —> How do we “fix” the relationship? What do we need to know in order to have a healthy relationship? How do we overcome our issues? The relationship is built around friendship, shared interests and coming together over creative ideas and endeavours. The four of wands is usually a very positive ‘party card’ that signifies things are going well. Since this is in the ‘problem’ spot, I read that my relationship is too friendly, that we’re more friends than we are romantic partners and that’s where the heart of the problem lies. What does completion mean in regards to the relationship? If I was having doubts about our relationship, this might be a signal that things have come to their natural end between us. Another way to read it is that there’s been an end to a cycle of our relationship or a form of our relationship, so it could be signifying evolution or growth. For me, in the context of my relationship, I definitely see that it’s showing me I’m too chummy with my romantic partner and that aspect of our relationship has been a key to our success as a couple in the past, but if we want to move forward it’s actually going to start holding us back. This is one of the most positive affirming cards in the whole deck. To me, it always signifies high female energy in a situation. I think it shows that the context of us being friends rather than romantic partners, that I’ve been leading the charge on that and it's actually more my fault than his. Like the four of wands card, it signifies good things ahead and a sort of time of reflection on the successes. The star also means “hope” so I think this is a sign that if I've been experiencing doubts or uncertainty, that I should take heart and have hope that my situation will improve and everything will work itself out in the end even if there seem to be no concrete answers to my questions. The world is the solution to my relationship problem! It's amazing how these three cards tie in together so perfectly. That’s part of the reason why I love doing a 3-card spread, particularly for relationships because it’s easy to tie the themes together and get to the deep thoughts and emotions quickly. The world signifies the end or completion of a cycle. It’s a time of rest and reflection. Instead of “doing” it’s time for “being”. It’s also a time to prepare for the next stage of my journey. I think that it’s telling me that I need to show gratitude to my relationship and to my partner for how far we’ve come, what we’ve managed to achieve and build together. It’s also time to prepare to jump into the great unknown again together, to look at our relationship with fresh eyes and be curious to discover ourselves further. How do these three cards work together? They show me in stages how to think about my relationship. Card 1 shows me what the problem is, card two gives me some insight in to the context of the problem. In this reading, the “problem” is that the relationship is built more around friendship rather than romance. The context is the hopeful star card so that tells me the problem is not much to worry about and that it might be driven by the feminine energy in the relationship meaning that it’s my fault! The third card, the solution to the problem, is to see my relationship as being a series of cycles or lifetimes, and it’s time or the cycle of being friends to end and the cycle of being romantic lovers to begin. I almost hear a tuning fork when I see this card because of its radiant quality. It’s a high feminine power card and very positive. Thinking of this card in the context of me in my relationship, I think it shows that I’m open to giving and receiving love. I got the chariot card as my challenge and I see it as relating to me and my work. I tend to get really consumed by work and neglect other aspects of my life. Right now, I feel like I’m riding this chariot energy in my career, powering through to the next stage and competitively fueling my creative energy. Huzzah! The three of cups is always a really curious card for me. I think it signifies good times with good friends and being happy with the people you’ve surrounded himself with. He’s feeling supported by his social circle. In the context of our relationship, I think it’s that he’s having a good time in the relationship and enjoying the memories we have been making on our recent vacation together! A butterfly emerges from a dark, dead patch of the woods. The message in this relationship reading is to rise above our previously-held truths of each other and move into the unknown. I see all the woods as being ideas or things that we previously held onto and the message of the card is to “let go” of those things we used to do and believe. This is a card of rising up and conquering your challenges, so I think it’s a hopeful message that we will be able to rise over the obstacles in the future. I think it’s pretty straight forward, you get insight into how you’re acting in your relationship and what’s keeping you from being your best in the relationship with cards 1 and 2. You get the same insight into your partner with cards 3 and 4. Card 5 puts them all into context and shows you the path forward or what’s going to be the uniting force in your relationship. For these readings, I used the Wild Unknown Tarot Deck.